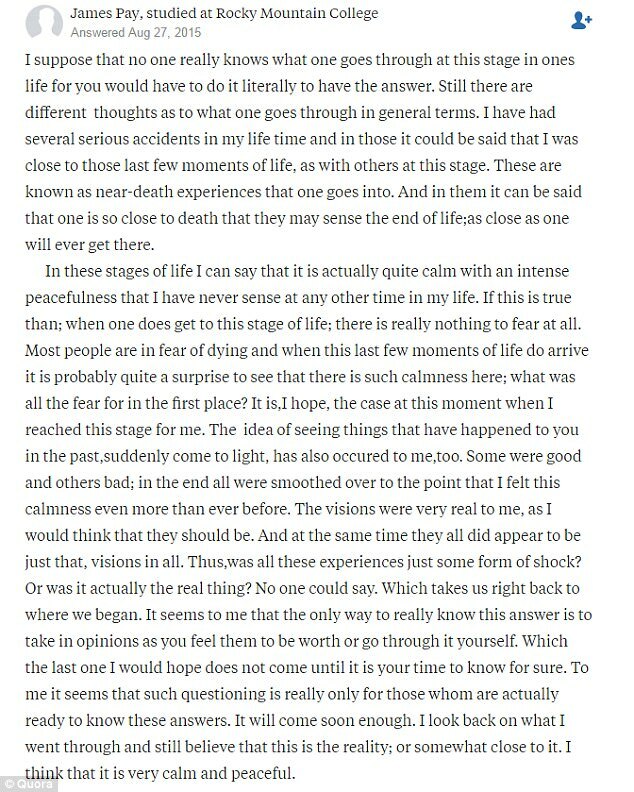 It's the one certainty that we will all face in the future, yet what it feels like to die remains the great unknown. 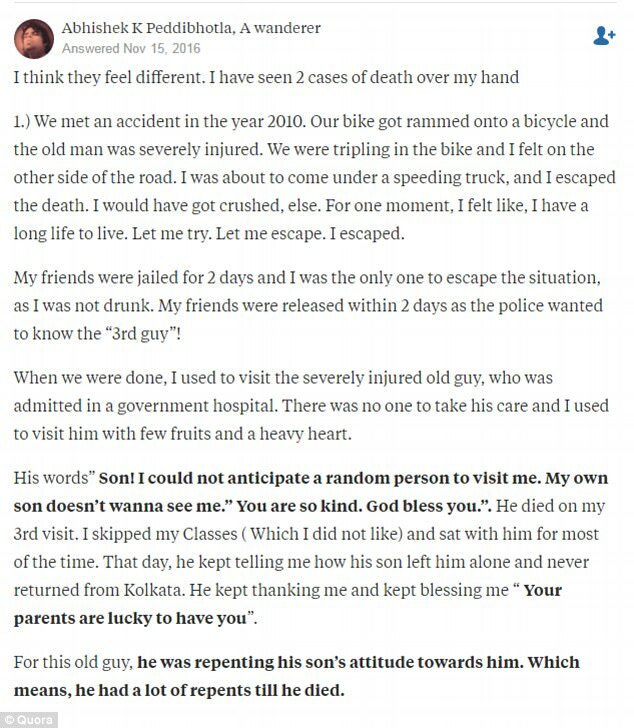 Those who may be able to share some insight, however, are people who have narrowly escaped death - and some have shared their experiences in a Quora thread to shed some light on one of life's greatest mysteries. 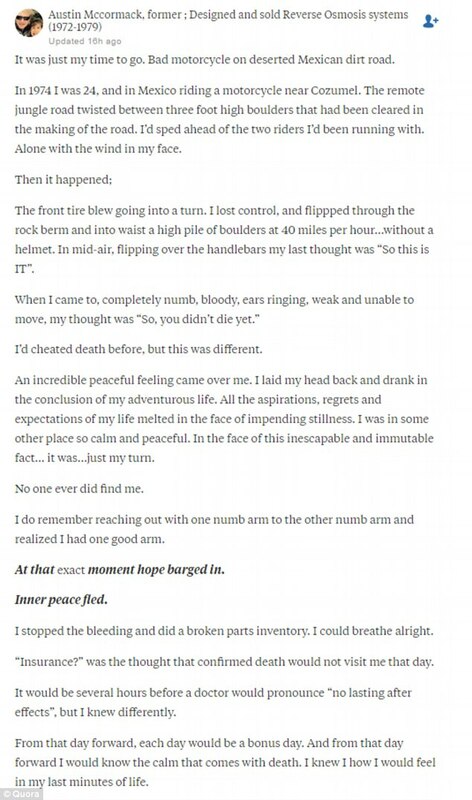 Christopher Mooney from Bristol was one of those who shared their experience with the question and answer site, explaining that he'd previously had a brush with death and believes he was 20 to 30 seconds from the end of his life. 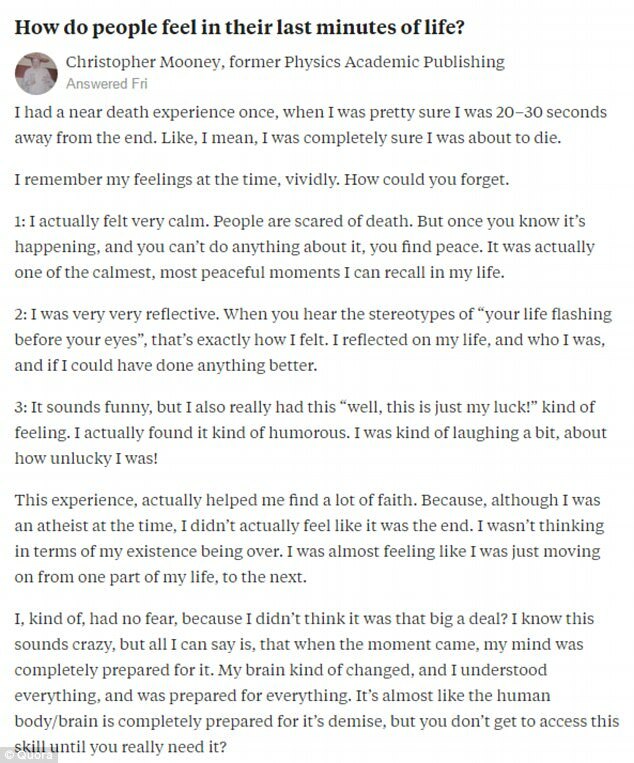 Reassuringly, he described feeling calm, saying it was one of the 'most peaceful moments' of his life, and he even saw the funny side of how unlucky he was. He added that the stereotype of life flashing before your eyes was true, as he reflected on the person he was and if he could have done certain things differently. 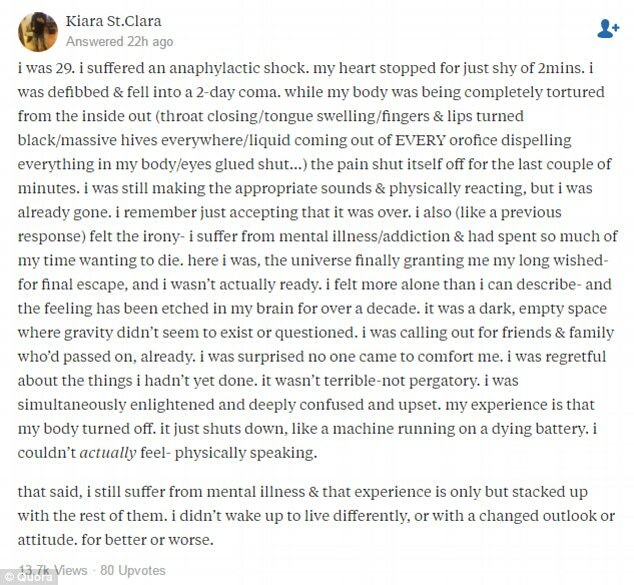 New Yorker Kiara St. Clara had a more traumatic tale to tell of when she suffered anaphylactic shock and her heart stopped for two minutes - an ordeal she describes as the worst loneliness she'd ever experienced. 'It was a dark, empty space where gravity didn’t seem to exist,' she said. 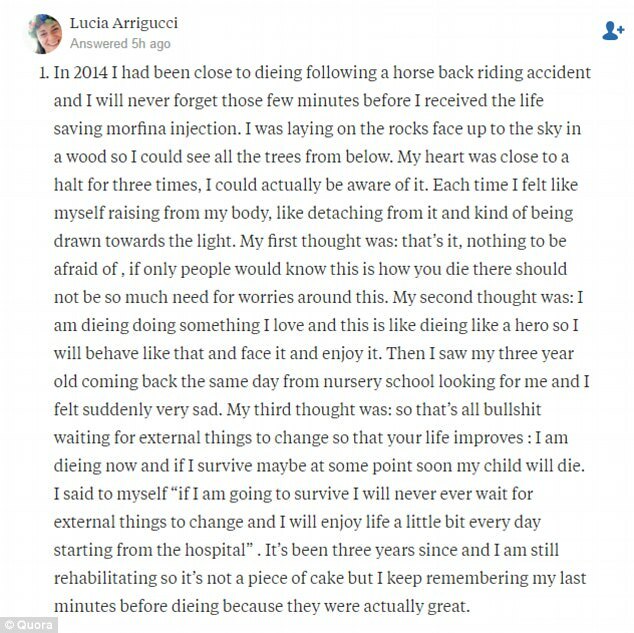 Kiara cried out for loved ones who had already passed away to help her, but nobody came and she felt regrets about things she hadn't yet done. 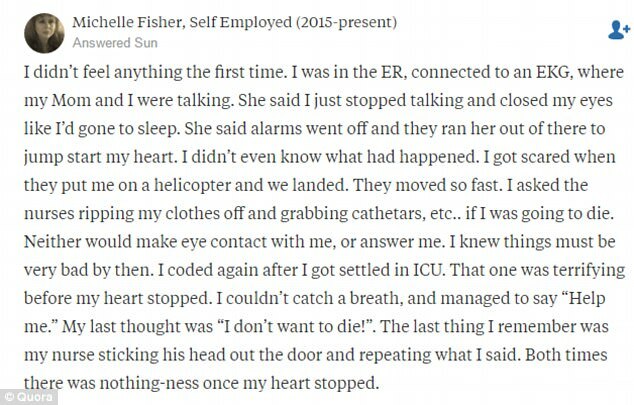 'I was simultaneously enlightened and deeply confused and upset,' she said. Another woman recalled feeling herself detaching from her body and being drawn towards a bright light.